We always hear that Oil & Gas companies are at the mercy of external factors like fluctuating economic conditions, so we could be forgiven if we forget the sheer amount of factors we can actually control internally to operate as efficiently and competitively as possible. A powerful tool to ensure we are utilizing the most out of our internal resources is the Knowledge Base, built out of the drilling operational database maintained by a company. Sitting as a gateway between the planning and execution of operations, we can utilise a repository of past knowledge to better optimise our use of resources in drilling wells, and predict, identify and evaluate the performance of each operation. By ensuring planning and execution activities flow through the Knowledge Base, we can help ensure our processes are as optimised as possible. In today’s economy, this is particularly important for a company’s capital management. A company’s Knowledge Base is built from the set of operations in their operational database, which have been structured according to some sort of coding system. While it is difficult to compare overall interventions with one another, even if they have the same goals and are executed in the same field, we can still compare individual operations. Overall interventions operate at the mercy of a variety of factors dependent on the time they are executed, while individual operations are simplistic enough to be compared to one another over time. Figure 2: Operations can be compared with each other, but interventions cannot. 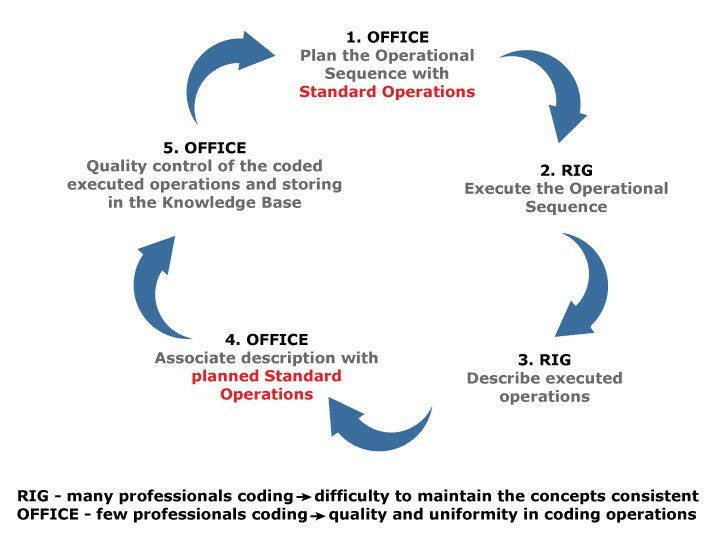 To ensure quality coding for all executed activities and the future consistency of coded operations it can be extremely helpful to structure daily data operations using an “Ontology of Operations”. An example structure involving over 200 operations can be seen below. Figure 3: Diagram of other entities related to an operation. Each box represents an entity and links between it and others to demonstrate their relationships. Terminations with “chicken feet” represent a relationship with many elements of that entity. For example, an Operation is composed of a Sequence of Steps (several steps) and is carried out with one or more Execution Standards. 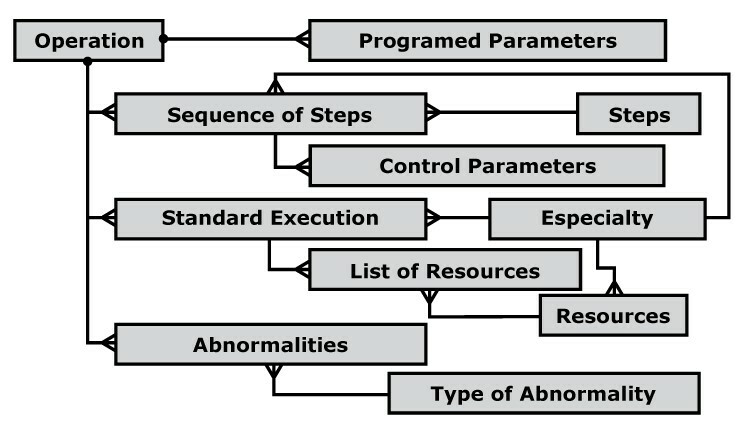 Each Execution Standard contains a List of Resources (several resources) for its execution. Additionally, during the execution of an Operation many Abnormalities can occur. But with about 200 code choices being made by several different personnel, how can you make sure that the coding quality and uniformity will lead to the desired comparison? We believe the best way to achieve uniformity between the rig and the office is to allow one or the other to take the lead. If both are tasked with coding daily operations the data is more susceptible to a lack of consistency, making it much harder to compare and optimise operations later on. In our own work we found it was best to allow the office to take charge of coding daily operations, freeing up rig operators to focus on the more hands on work. Given the data will be processed and analysed in the office anyway, the added familiarity with the coding procedure helps a lot. How this can work in practice is shown in the diagram below. Figure 4: Flowchart to create and use the Knowledge Base. Consistently coded operations increases the usefulness of a company’s knowledge base tenfold, especially when it comes to risk analysis and Monte Carlo simulation, and ensuring interventions are informed by this knowledge base allows for more optimal use of a company’s scarce resources. This can be compared to the business philosophy of understanding a company’s strengths and weaknesses to recognise opportunity. There is no better way for a company to do this than not only monitoring performance over time, but also utilising the latest technology to do this at the micro level. After all, in the high risk, high reward Oil & Gas industry the potential for the smallest of factors to generate a substantial impact on overall operations remains very real. Make the Knowledge Base the centrepiece of the analysis and planning of your drilling operations.